This article's citation style may be unclear. The references used may be made clearer with a different or consistent style of citation, footnoting, or external linking. Operation Overlord was the 1944 campaign for the invasion of continental Europe in World War II. It was fought by the Allied forces against German forces. The most critical part was the Normandy landings, which were to get the Allied armies onto the continent of Europe. This might have failed. Heavy casualties were expected, even if it succeeded. It was successful. The Battle of Normandy raged until German forces retreated across the Seine on 30 August 1944. This marked the close of Operation Overlord. It was the largest invasion by sea in history. Almost three million troops crossing the English Channel from England to Normandy in then German-occupied France. The main Allied forces came from the United States, United Kingdom, and Canada, but another nine nations sent units, the rest being Australia, Belgium, Czech Republic, France, Greece, the Netherlands, New Zealand, Norway and Poland. Operation Overlord was the largest and deadliest amphibious assault in the history of warfare. Allied troops made many practice landings to understand how to do it. Maps of Normandy beaches were created. The planners knew heavy tanks and transport could not travel on the beaches, which had soft peat underneath them. Detailed maps of the area were required. Where peat had to be travelled on, the plan was to lay down matting. On 7 April and 15 May, Bernard Montgomery presented his plan for the invasion. He planned a ninety-day battle, ending when all the forces reached the Seine. The goal for the first 40 days was to capture Caen and Cherbourg (especially Cherbourg, for its deep-water port). Then Brittany and its Atlantic ports would be captured. Railways and roads in northern France would be bombed to block reinforcements for the defenders. Next, the Allies would go 125 miles (190 km) to the southwest of Paris. The Allies would then control the land between the rivers Loire in the south and Seine in the northeast. Meanwhile, the Allies made great efforts to make the Germans think the invasion would happen elsewhere. The Allies developed new technology for Overlord. The "mulberry", a mobile concrete harbor, allowed the Allies to supply their soldiers on the beach without capturing one of the heavily defended Channel ports. Major-General Percy Hobart, a military engineer, designed modified Sherman and Churchill tanks. In the months leading up to the invasion, the Allies worked at military deception. German coastal defences were stretched thin in 1944. Once Normandy had been chosen as the site of the invasion, it was decided to attempt to trick the Germans into thinking it was a fake invasion and that the true invasion was to be elsewhere. This was called Operation Bodyguard. 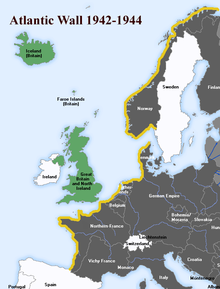 In the weeks leading up to the invasion, the Allies tried to make the Germans think that the main invasion would take place at the Pas de Calais and in Norway. The deception was an industry in itself. It included dummy messages, dummy tanks in places near Dover and the south coast of England, using double agents to spread false information, dummy radio messages, and so on. The deception was highly successful. It led Hitler to delay sending reinforcements from the Pas de Calais region for nearly seven weeks (the original plan had specified 14 days). In his memoirs, General Omar Bradley called Bodyguard the "single biggest hoax of the war". Allied forces rehearsed their roles for D-Day months before the invasion. On 28 April 1944, in south Devon on the British coast, 946 American soldiers and sailors were killed when German torpedo boats attacked one of these landing exercises, Exercise Tiger. The security of D-Day was supported by stopping unplanned news from getting out of Britain. Travel to and from the Republic of Ireland was banned, and movements near the coasts was not allowed. The German embassies and consulates in neutral countries were given false information. All the same, there were several leaks before or on D-Day. An embassy spy in Istanbul gave the Germans documents containing references to Overlord, but these documents lacked detail. Another leak was General Charles de Gaulle's radio message after D-Day. He stated that this invasion was the real invasion. [nb 1] This had the potential to ruin the Allied tricks. 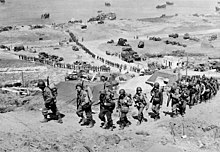 Eisenhower referred to the landings as the initial invasion. The Germans did not believe de Gaulle and waited too long to move in extra troops against the Allies. The British did an airborne assault on the River Orne. The British goal was to capture the Orne River bridges to prevent German armor from using them and to prevent retreating Germans from blowing them up. This way, they could be used by Allied armor and vehicles. The British sea attack units would attack through Sword and Gold Beaches. The United States had an airborne division and land units, which were to take Omaha Beach, the Pointe du Hoc and Utah Beach. The Canadians would work with British units to attack Sword Beach. The British and Canadians had separate beaches, Gold Beach and Juno Beach, respectively. The Invasion Fleet was made upfrom eight navies made up of warships and submarines, split into the Western Naval Task Force (Rear-Admiral Alan G Kirk) and the Eastern Naval Task Force (Rear-Admiral Sir Philip Vian). The fleet was led by Admiral Sir Bertram Ramsay. The Allies assigned codenames to the various operations involved in the invasion. Overlord was the name for the landing on the Continent. Getting a secure hold on the area was codenamed Neptune. It began on D-Day (6 June 1944) and ended on 30 June 1944. By this time, the Allies had control in Normandy. Operation Overlord also began on D-Day, and continued until Allied forces crossed the river Seine on 19 August 1944. Through most of 1942 and 1943, the Germans thought successful Allied invasion in the west would not happen. Preparations were limited to building fortifications at the major ports. The number of military forces in Nazi Germany reached its peak during 1944 with 59 divisions in France, Belgium and the Netherlands. Field Marshal Erwin Rommel was in charge of the wall. He improved the defences of the entire coastline. Steel obstacles were put on beaches, concrete bunkers and pillboxes constructed, and low-lying areas were flooded. Pointed stakes were set up on likely landing grounds to make it hard for the Allies to do airborne landings. The Germans fortified the foreshore area as part of their Atlantic Wall defences (including tank turrets and barbed wire). These projects were not finished, especially in the Normandy sector. Allied bombing of the French railway system made it hard to move materials, and the Germans were convinced by the Allied tricks that the landings would take place in the Pas de Calais. The sector which was attacked was guarded by four divisions, of which the 352nd and 91st were of high quality. 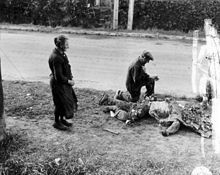 The other defending troops included Germans who were not fit for active duty on the Eastern Front, conscripted Poles and former Soviet prisoners-of-war who had agreed to fight for the Germans. These units had German leaders. Rommel's defensive measures were made difficult by arguments over how to use armoured forces. Von Geyr and Rommel disagreed over the how to use Panzer divisions. Rommel thought armoured formations be close to the coast, to attack while the invaders were weak. Von Geyr said they should instead be put around Paris and used in a big group when the Germans knew which beach was being invaded. Hitler made a compromise solution. Rommel was given only three tank divisions, one of which was close enough to the Normandy beaches to fight on the first day. The other mechanized divisions were put under the control of the German Armed Forces HQ (OKW) and were placed across France, Belgium and the Netherlands. The opportunity for launching an invasion was limited to only a few days in each month, because a full moon was needed. This would provide light for the aircraft pilots and create a spring tide. Eisenhower had picked 5 June as the date for the assault. However, on 4 June, conditions were unsuitable for a landing. High winds and heavy seas made it impossible to launch landing craft. Low clouds would prevent aircraft finding their targets. Meteorologists predicted an improvement in the weather for 6 June. At a meeting on 5 June, Eisenhower and his senior commanders discussed the situation. Eisenhower decided to launch the invasion that night. Had Eisenhower delayed the invasion, the only option was to go two weeks later. This would have been during stormy weather. To make it hard for the Germans to launch attacks during the sea attack phase, airborne operations were used to capture bridges and road crossings. The airborne landings behind the beaches were also designed to help the soldiers landing on beaches and destroy German coastal defense artillery. HMS Lawford, one of several Captain class frigates converted to act as a headquarters ship for the Normandy landings. Lieutenant General Omar Bradley (second from the left) and other senior officers aboard the USS Augusta during the Normandy Invasion. On Sword Beach, the regular British infantry came ashore with few casualties. They had advanced about 8 kilometres (5.0 mi) by the end of the day but did not get as far as Montgomery had wanted. Caen was still held by Germans by the end of D-Day and would remain so until Operation Charnwood on 9 July. The Canadian forces that landed on Juno Beach had a difficult battle. German concrete fortifications and a sea wall twice as high as at Omaha Beach made it very difficult to attack. Juno was the second most heavily defended beach on D-Day, next to Omaha. Canadians were off the beach within hours and advancing inland. 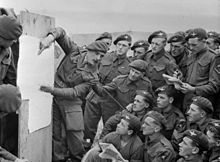 They were the only units to reach their D-Day goals, although most units fell back a few kilometres to make stronger defensive positions. At Gold Beach, there were many dead and wounded because the Germans had strongly fortified a village on the beach. The 50th (Northumbrian) Infantry Division advanced almost to Bayeux by the end of the day. When commando units captured the Port-en-Bessin, the Allies could use their PLUTO pipeline to bring in fuel. The Americans who landed on Omaha Beach faced the veteran German 352nd Infantry Division, one of the best trained groups on the beaches. Furthermore, Omaha was the most heavily fortified beach. Commanders considered abandoning the beach but small units of infantry got past the coastal defences. By the end of day two areas had been captured. The control over the beach expanded over the following days and the D-Day goals were accomplished by D+3. At Pointe du Hoc, the 2nd Ranger battalion had to climb the 30 metres (98 ft) cliffs. While they climbed, the enemy shot at them and dropped grenades. They used ropes and ladders to climb up and then destroy the guns. The beach fortifications were important targets since a single artillery observer could have directed fire on the U.S. beaches. The Rangers captured the fortifications. They then had to fight for 2 days to hold the location, losing more than 60 percent of their men. The number of dead and wounded on Utah Beach, the westernmost landing zone, were the lightest of any beach. Only 197 out of the 23,000 troops that landed were killed or wounded. The 4th Infantry Division troops that landed on the beach was able to move inland by early afternoon, linking up with the 101st Airborne Division. American troops in an LCVP landing craft approach Omaha Beach 6 June 1944. Once the beaches were controlled, the Mulberry Harbours were set up around 9 June. One was constructed at Arromanches by British forces, the other at Omaha Beach by American forces. Severe storms on 19 June caused problems with the landing of supplies and destroyed the Omaha harbour. The Arromanches harbour was able to supply around 9,000 tons daily until the end of August 1944, by which time the port of Cherbourg had been captured by the Allies. The German 21st Panzer division attacked between Sword and Juno beaches and nearly reached the Channel. Allied anti-tank gunners made them pull back before the end of 6 June. The Allied invasion plans had called for the capture of Carentan, St. Lô, Caen and Bayeux on the first day. The plan was to link all the beaches except Utah and Sword (the last linked with paratroopers) and a front line 10 to 16 kilometres (6.2 to 9.9 mi) from the beaches. None of these goals had been achieved. The number of dead and wounded had not been as heavy as some had feared (around 10,000 compared to the 20,000 Churchill had estimated) and the bridges had survived the German attacks. In the western part of the invasion area, US troops were to occupy the Cotentin Peninsula, especially Cherbourg. This would provide the Allies with a deep water harbour. The land behind Utah and Omaha was banks and hedgerows that tanks, gunfire and vision could not get through. This made them ideal defensive positions. The U.S. infantry made slow progress and had many dead and wounded as they moved towards Cherbourg. The airborne troops were used to help with the advance. The far side of the peninsula was reached on 18 June. Hitler told German forces not to retreat to the strong Atlantic Wall fortifications in Cherbourg. The Cherbourg commander, Lieutenant General von Schlieben, surrendered on 26 June. Before surrendering he had most of the facilities destroyed, making the harbour inoperable until the middle of August, by which time the combat front had moved so far east that it was less helpful. While the Americans headed for Cherbourg, a unit of troops led by the British moved towards Caen. Montgomery made many attrition warfare attacks. The first was Operation Perch, which moved south from Bayeux to Villers-Bocage where the armour could capture Caen. It was halted at the Battle of Villers-Bocage. Caen was bombed and then occupied north of the River Orne in Operation Charnwood from 7 July until 9 July. An attack in the Caen area followed with all three British armoured divisions, codenamed Operation Goodwood from 18 July until 21 July. It captured the high ground south of Caen. The rest of the city was captured by Canadian forces during Operation Atlantic. A further operation, Operation Spring, from 25 July until 28 July, by the Canadians secured limited land south of the city, but with many dead and wounded. 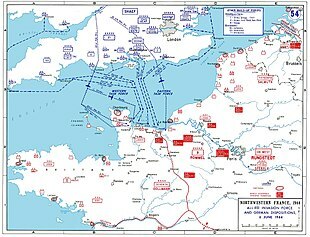 Map showing the breakout from the Normandy beachhead. Montgomery's plan included keeping the Germans in the eastern part of the invasion area, while protecting Cobra's position. By the end of Goodwood, the Germans had used the last of their reserve divisions; there were six and a half Panzer divisions against the British and Canadian forces compared to one and a half facing the United States armies. Operation Cobra was launched on 25 July by the U.S. First Army. It was successful. The VIII Corps entered Coutances at the western end of the Cotentin Peninsula on 28 July, after breaking through the German lines. On 1 August, VIII Corps became part of Lieutenant General George S. Patton's Third Army. On 4 August, Montgomery changed the invasion plan by sending a corps to occupy Brittany and push the German troops around the ports, while the rest of the Third Army continued east. 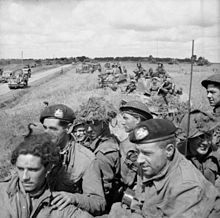 Because of the large number of German forces south of Caen, Montgomery moved the British armor west and launched Operation Bluecoat from 30 July until 7 August to add to the attacks from the United States armies. This pushed the German forces to the west, allowing the launch of Operation Totalize south from Caen on 7 August. By the beginning of August, more German reserves became available. The German forces were being encircled and the German High Command wanted these reserves to help with a retreat to the Seine. Hitler demanded an attack at Mortain on 7 August. The attack was pushed back by the Allies, who again had advance warning from Ultra code breaking. The original Allied plan was for encircling the Germans as far as the Loire valley. Bradley realized that many of the German forces in Normandy were not able to move by this stage and he got Montgomery's approval by telephone on 8 August for to encircle German forces. This was left to Patton to do. He moved nearly unopposed through Normandy. The Germans were left in near Chambois. Strong German defense and the sending of some American troops for an attack by Patton towards the Seine at Mantes prevented the Germans from being trapped until 21 August. On this date, 50,000 German troops were trapped. Whether this could have been done earlier with more prisoners taken has been debated. The liberation of Paris followed shortly afterwards. The French Resistance in Paris rose attacked the Germans on 19 August. The French 2nd Armoured Division under General Philippe Leclerc, along with the U.S. 4th Infantry Division accepted the surrender of the German forces there and liberated Paris on 25 August. American troops on board a LCT, ready to ride across the English Channel to France. 12 June 1944. Operations continued in the British and Canadian sector until the end of the month. On 25 August, the 2nd U.S. Armored Division fought its way into Elbeuf, making contact with both British and Canadian armoured divisions there. The 2nd Canadian Infantry Division advanced into the Forêt de la Londe, on the morning of 27 August. The area was strongly held and the 4th and 6th Canadian brigades had large numbers of dead and wounded over three days as the Germans defended their position. The Germans pulled back on the 29th, withdrawing over the Seine on the 30th. On the 30th the 3rd Canadian Infantry Division crossed the Seine near Elbeuf and entered Rouen to a happy welcome. Sword Beach was the easternmost beach on D-Day, and was attacked by the British 3rd Infantry Division, supported by units of the 79th Armoured Division. It was successful. Juno Beach was the next beach to the west. It was attacked by the Canadian 3rd Division. It was also successful. Gold Beach was the "middle" beach, lying between Sword, Juno, Omaha, and Utah beaches. It was attacked by the British 50th (Northumbrian) Division. Omaha Beach was the second western-most beach. It was attacked by the American 1st Division. The bombardment before the assault was successful on every beach except Omaha, so German bunkers and artillery still remained. The battle was hard, but eventually the Americans won. Almost 2,500 Americans died on Omaha Beach. Utah beach was the western-most beach. It was mostly successful, and it was attacked by the American 4th Division. The campaign in Normandy is considered by historians to end either at midnight on 24 July 1944 (the start of Operation Cobra on the American front), 25 August 1944 (the liberation of Paris), or 30 August 1944, the date the last German unit retreated across the River Seine. Victory in Normandy was followed by a pursuit to the French border in short order. Germany was forced once again to reinforce the Western Front with manpower and resources from the Soviet and Italian fronts. By September, Allied forces of seven field armies (two of which came through southern France in Operation Dragoon) were approaching the German frontier. The Allied battle plan was good, drawing on the strengths of both Britain and the United States. German leadership was often faulty, despite good fighting by German units. In a larger context the Normandy landings helped the Soviets on the Eastern front, who were facing most of the German forces. It shortened of the conflict there. Victory in Normandy stemmed from several factors. The Allies had more weapons and equipment. They also had new inventions like the PLUTO pipelines and Mulberry harbours. These helped the flow of troops, equipment, fuel and ammunition. Movement of cargo over the open beaches went better than expected,even after the destruction of the U.S. Mulberry in the channel storm in mid-June. 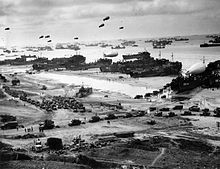 By the end of July 1944, one million American, British, Canadian, French, and Polish troops, hundreds of thousands of vehicles, and a lot of supplies were ashore in Normandy. Artillery ammunition and other items were plentiful. This was impressive considering they did not hold a port until Cherbourg fell. By the time of the Normany breakout the Allies also had superiority in numbers of troops (approximately 3.5:1) and armored vehicles (approximately 4:1) which helped overcome the natural advantages the rough land gave to the German defenders. Allied intelligence and counterintelligence efforts were successful. The Operation Fortitude trick plan before the invasion kept German attention focused on the Pas-de-Calais. High-quality German forces were kept in this area, away from Normandy, until July. Prior to the invasion, few German reconnaissance flights took place over Britain, and those that did saw only the fake camps. Ultra decoding of German Enigma (machine) communications had been helpful as well, exposing German plans. Lack of an organized strategy hurt the German defence. German leadership was split between Field Marshals von Rundstedt and Rommel. Von Rundstedt wanted to keep the powerful units in reserve, to do a powerful counterattack once the allied landing started. Rommel wanted to stop the allies at the beach. He tried to locate units so that they could attack quickly. While Rommel's plan was good, the reserve strategy was not good because units could not move during the day due to allied air strikes. In the end, the mix of two strategies was a disaster. The beach defences were overcome and the counterattacks were not strong enough. German commanders at all levels failed to react to the attack quickly. Communication problems added to the problems caused by Allied air and naval firepower. Local commanders did not lead an aggressive defence on the beach. The German High Command focused on the Calais area, and von Rundstedt was not permitted to use the armored reserve. When it was finally released late in the day, success was more difficult. Although the 21st Panzer Division, had attacked earlier, it faced strong opposition that had been allowed to build at the beaches. 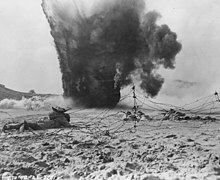 Overall, even though the Allied material superiority continued to grow, the Germans slowed the Allies advance for nearly two months, aided by the rough land. Although there were several disputes among the Allied commanders, their plans were decided by the main commanders. By contrast, the senior German leaders always had interference by Hitler, who did not know local conditions. Field Marshals von Rundstedt and Rommel repeatedly asked Hitler for more freedom to change plans but were refused. Von Rundstedt was removed from his command on 29 June after he told Field Marshal Keitel, the Chief of Staff at OKW (Hitler's Armed Forces HQ), to make peace. Rommel was severely injured by Allied aircraft on 16 July. Field Marshal von Kluge, who took over the posts held by both von Rundstedt and Rommel, was linked with some of the military plotters against Hitler, and he would not argue with Hitler for fear of arrest. As a result, the German armies in Normandy were pushed by Hitler to counterattack rather than retreat after the American breakthrough. Kluge was relieved of command on 15 August and killed himself. The more independent Field Marshal Walter Model then took command. ↑ "We are told that an immense assault force has begun to leave the shores of Old England to aid us." 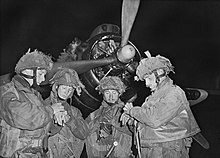 ↑ Montgomery wrote of his intent to tie down German armoured forces near Caen in a policy directive on 30 June 1944: "My broad policy, once we had secured a firm lodgement area, has always been to draw the main enemy forces into the battle on our eastern flank, and to fight them there, so that our affairs on the western flank could proceed the easier." ↑ Three million by the end of August 1944, but only 160,000 on D-Day itself. One and a half million were landed by the end of Operation Overlord. ↑ Wilmot 1952, pp. 224–226. ↑ Video: Cherbourg, Gateway to Victory, 1944/07/02 (1944). Universal Newsreel. 1944. Retrieved 22 February 2012. ↑ Weigley 1981, p. 157. ↑ Kennedy Hickman. "World War II: Operation Cobra - Breakout from Normandy". About.com website. Retrieved 3 May 2014. ↑ 16.0 16.1 Stacey 1960, p. 286. ↑ Stacey 1948, p. 295. ↑ Stacey 1948, p. 195. ↑ Stacey 1960, p. [page needed]. ↑ Zaleznik, A. (August 4, 2008). Hedgehogs and Foxes: Character, Leadership, and Command in Organizations. Springer. p. 11. ISBN 978-0230614154. This page was last changed on 22 October 2018, at 04:17.